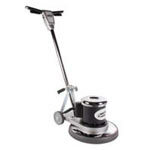 This NaceCare 20" dual speed floor buffer has a tough all steel construction, giving you years of use. The dual speeds on this machine will let you work on both carpeting and hard floor surfaces. The lower 175 rpm is more appropriate on the carpet scrubbing and bonneting end of things, and the 300 rpm setting is better for hard floor scrubbing and light buffing. The best of both worlds in one machine. Take a look at our complete line of 20 inch variable & dual speed floor machines for cheaper, single speed models. Heavy-duty, 1.5 hp DC rectified motor. 1 year warranty on parts & labor.